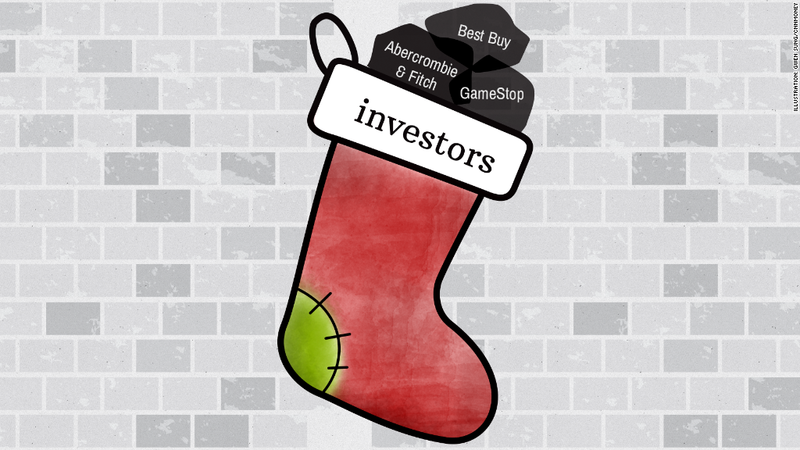 The holidays might give shoppers jaw-dropping deals, but they often leave retail investors with a big lump of coal. History shows that retail stocks have a lousy end of the year. That's probably because those deep discounts that shoppers love don't go over so well with investors. Heavy incentives may juice sales, but they also eat into companies' bottom lines. That's definitely not on Wall Street's wish list. "Even though the Thanksgiving through Christmas period is the best time of the year for the cash registers of retailers, the best time of the year for their stocks usually ends just when the holiday shopping season is getting into full swing," analysts at Bespoke Investment Group wrote in a note to clients. In other words, the time to buy retail stocks is after the holidays are done. Retailers in the red: That's especially true for two of the sectors most closely associated with the holidays: apparel and electronics. Since 2000 the computers and electronics subgroup has declined 3% on average in the period between Thanksgiving and New Year's, according to Bespoke. These stocks, which include the likes of Best Buy (BBY) and GameStop (GME), are up a mere 29% of the time during this window. Compare that to the S&P 500, which has rallied nearly 80% of the time between Thanksgiving and New Year's, posting an average gain of 1.8%. Things aren't much better for apparel retailers. This group has suffered an average decline of 0.3% after Thanksgiving since 2000. The only exception to this rule are Internet retailer like Amazon.com (AMZN). Thanks to soaring e-commerce sales, Internet retailers tend to outperform the S&P 500 during the holidays. Deep discounts ahead? It's too early to say how retail stocks will perform this holiday season, but investors will be watching for signs that struggling retailers like JC Penney (JCP) and Urban Outfitters (URBN) are marking their items down aggressively. Wall Street could get more clues on pricing strategies this week when a slew of retailers hit the earnings stage. Big names set to report results include Best Buy, Gap (GPS), Target (TGT), TJ Maxx owner TJX Cos (TJX) and Urban Outfitters. Home Depot (HD)and Lowe's, (LOW) both of which are trading near all-time highs, are also scheduled to give their corporate "report cards" this week. Retailers hope the recent dip in gasoline prices leaves consumers with more cash to spend on gifts this year. The latest statistics paint a cautiously optimistic picture heading into the holidays. On Friday the government said retail sales ticked up 0.3% in October, bouncing back from a slight dip in September.